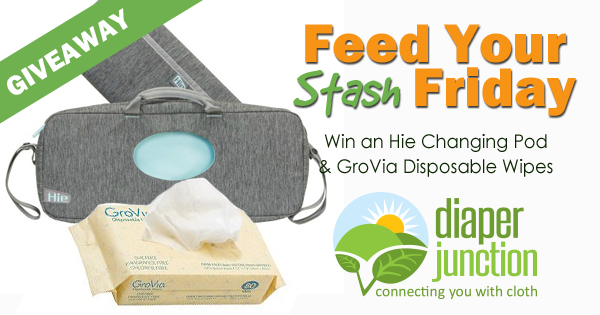 Win an Hie Changing Pod & Disposable Wipes from Diaper Junction! One lucky winner will receive an Hie Changing Pod of their choice from our in stock selection PLUS a package of GroVia Disposable Wipes! This contest is open to the USA & Canada. Must be 18 yrs or older to enter to win. Winner will be notified by email and will have 7 days to reply and claim their prize. I would pick Basalt color! These are wonderful. I would choose Basalt. I would choose coolee. It’s classic and could match almost anything! I love them both! But I would probably choose Basalt as a darker charcoal gray. I'm loving the Basalt! All my baby gear is grey! Oh, so hard to pick. But I think coulee would go best with my Oxford bag....? I'd choose a basalt! I love darker colors! I would love either color. It is so hard to pick, because botha re so nice! Basalt, might win only because it feel it would conceal dirt marks easier. I would choose the Basalt changing Pod. I love dark grey! I would choose basalt! I tend to like darker colors more. I love GroVia, would love to win in either color! Basalt! Love a good dark grey. I would love this changing pod. I'm a FTM to a 9 day old and am looking for a great lightweight solution for a quick trip that I don't need the entire diaper bag for. I would choose Basalt to hide possible dirt marks. I like Basalt the best! That's what I would choose. Thanks for the opportunity! I like the coulee color the best...that's what I would choose! My favorite color is the coulee. I would love the try one of these! I’d choose Basalt- it matches my current diaper bag perfectly. I think I would choose Coulee!